Click apperenace on the wordpress dashboard, then click header – then on the header screen pick a Default Image or upload your own header. Then Click save changes. I’m also having trouble with this. I can see where I can change the image to one of the 4 or 5 that are pre-loaded, but I cannot find an option for uploading a new HEADER image. I’m not talking about the background (I see that option). The header image specifically. Thank you Prasanna, however my problem is that I do not see BUTTONS for browsing/choosing a file from my computer. It seems you are using Live Customization feature. Go to Dashboard –> Appearance –> Header. 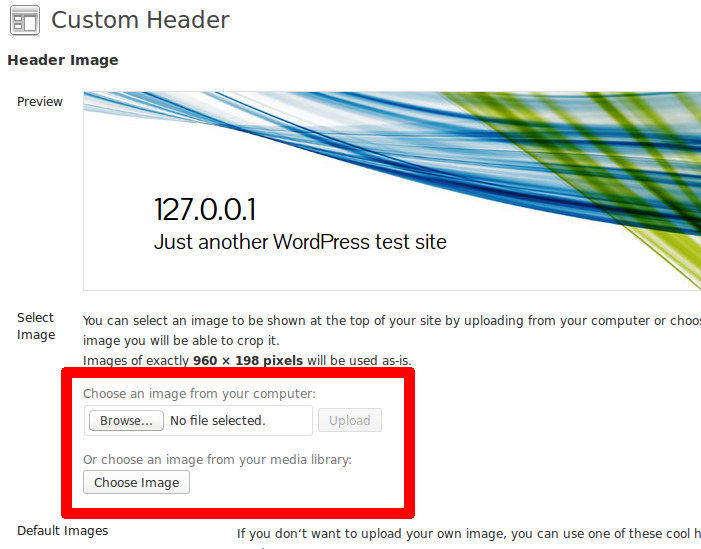 There you’ll see the option to choose/upload header image.